Shakira’s hips don’t lie but can we say the same for the SW Florida real estate market numbers? Actually the Association of Realtors hasn’t released official numbers so agents like us are left to report our own numbers based upon predefined searches. 3 Weeks ago we asked the question “Where Are The Listings?” MLS shows an increase in listings but we weren’t seeing it on the street. Our team is down to 13 listings. We have more pending and closed than we do actual listings. We keep hearing on the street inventory is down and it’s hard to find properties to show buyers, so we decided to search MLS for ourselves and report the counts. We’re wondering if the MLS changed classification on certain listings because in January the numbers shot up. As a property goes pending it comes out of active inventory, and we’ve been putting a lot of properties pending in the past 3-4 weeks. Is it possible more listings are coming on the market than coming off? We think that’s doubtful. I’ve been in contact with the association to get official numbers and the answer I get is they are not being released as usual until the Board meets. We compile numbers from various MLS systems and each time an MLS changes vendors it creates havoc as the data sharing policies and technologies need to be tweaked. Cape Coral and Bonita Springs recently selected a different vendor than Fort Myers so this could be causing a delay in releasing numbers. It can also alter the data drastically. Even if data is shared there can be duplicate data as the same home can be input into two or more MLS’s. I always hate MLS changeovers more than most agents because we do compile data and it forces us to not only search multiple MLS’ like an agent does, but forces us to compile and make decisions about duplicates. We like to report apples and apples and that is always hard when a changeover occurs. It forces us to restate new baselines in the data and move forward from there. In a perfect world all MLS systems would share data and use the same vendor, but we don’t live in a perfect world. 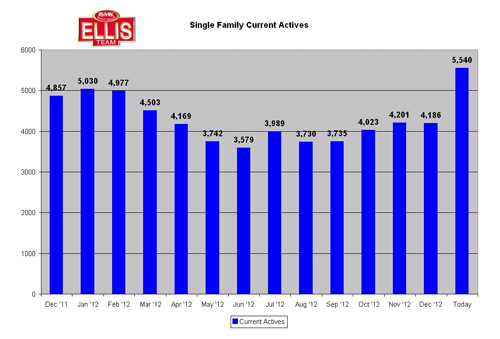 For the time being these numbers are the best we’ve got, and we’re skeptical inventory is rising. Our personal listing inventory is selling quickly this season and shrinking. If a home is marketed properly and priced correctly, it should sell. We have more buyers here now than we will any other time of the year. If a home doesn’t sell now, it may not sell at the same price the rest of the year. Of course, there is one caveat. We are in a rising price market, so if you’re over priced today, eventually the market may catch up to your price. Of course, with Sequestration, looming government shutdowns and a national debt crisis, nobody knows what the future will bring exactly. Our advice is if you want to sell today, market it and price it at today’s market. If you wait for something that may or may not occur in the future, you run the risk of being disappointed, and with Congress and the President today, there’s a pretty good chance they’ll disappoint nearly everybody in the coming weeks and months. If you have a property to sell, please call us. We know how to market, and our properties are selling. We’ve got about a month left for high season, so there’s still time to maximize buyers for your home. If you’re a buyer and you see a home you like, jump on it because even though the numbers say inventory is up, we’re not seeing that on the street. Successfully selling your home in today’s market takes at minimum 3 key ingredients. Hiring an agent that helps the seller accept the correct contract and navigates it to closing is probably the most important aspect because you never wish to have to sell the same home multiple times. It’s always best to select best offer and close it first time. If the home is marketed and priced correctly in many cases there will be multiple buyers, not because the home is under-priced but rather because it’s properly valued and substantially exposed to the market. So let’s set aside marketing for a moment and discuss pricing. Some properties are fairly easy to value, especially when there are similar floor plans in a subdivision and several recent sales to choose from. Not all homes are located in defined subdivisions, and sometimes in today’s market there is an absence of like kind properties that have sold. For years agents have compared subject properties to all available comparables the agent could find. While the research was important and the best available at the time, there is now a new way to look at the overall picture. Several factors beyond what neighbors sold their home for affect the value. For instance, job growth, population growth, community lifestyle, schools, safety, affordability, potential appreciation and more affect a buyer’s decision on which home to buy. 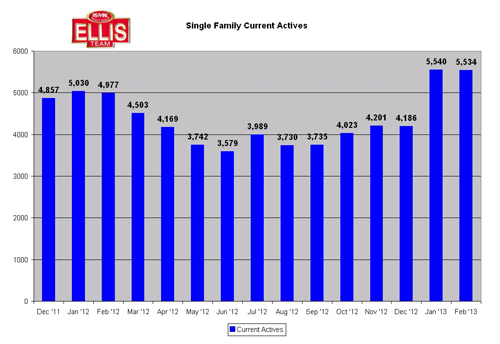 At the Ellis Team we’ve invested significant money and research into developing systems to gather data, analyze, and report these factors and ratings. All Realtors in the Fort Myers/Cape Coral MLS have access to certain reports like ReaList that we reported on a few months ago. Zillow also offers some limited information. ReaList, Trulia, and Zillow offer their free home valuation tool, and pretty much everyone in the industry agrees it’s a fun informational tool but cannot be relied upon as fact when determining value. We like to look at them because buyers look at them and think their estimate is Gospel, so agents spend a lot of time educating public about how accurate they may or may not be. The Ellis Team at RE/MAX not only looks at comparables, estimates from third party sites like those mentioned above, and tax data, we also utilize additional research that helps our sellers better price their home. Sellers overprice in any market regardless of whether it’s going up down, or sideways. Our goal is to get you out at the best price and expose your home to the masses so we can select the best offer available. If you’re thinking of selling, give us a call 239-489-4042 or email me at brett@topagent.com We’ll be glad to sit down and show you how we market, how we negotiate and select the best offer, and how best to price your home. Each year trends emerge in the SW Florida real estate market. Yesterday during our team sales meeting a trend reared up and identified itself and we thought we’d report what we’re seeing. In years past we’ve reported that the Germans were finding SW Florida attractive based upon what they can buy for their money, weather, exchange rates, etc. Another year we saw the British coming over and buying, and another year the Canadians were strong. In fact, that particular year the Wall Street Journal called us for an article they were doing about Canadians buying in the US. The ironic thing was we had 3 sets of Canadians in our office at that very moment. This year, we’re seeing strong interest again from the Canadians. Each of our buyer specialists pointed out they’ve been working with several Canadian buyers, and one buyer specialist couldn’t attend the meeting because he was out with a Canadian buyer. This year they tend to be buying higher priced homes as well. Our buyer specialists pointed out buying now may be much less than renting at high season rates. Currently the exchange rate from Canada is .99 which means roughly the Canadian dollar and the US dollar are about equal. While true for the past few years, this hasn’t always been the case. Back in 2009 the rate was about .80 which means property here costs Canadian buyers about 20% more. So even though prices here are rising, they may compare favorably to prices in Canada, and they don’t have an exchange rate penalty. 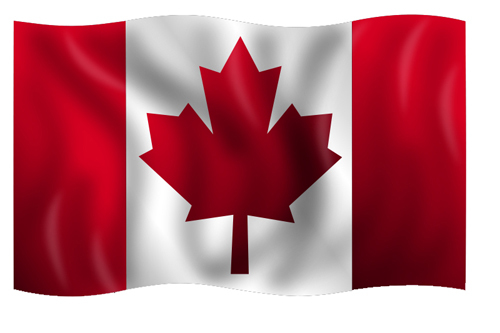 After listening to the buyer agents compare notes I realized several of our pending listings are from Canadians. One is a US buyer who is selling her home to a Canadian, so even that sale was influenced. 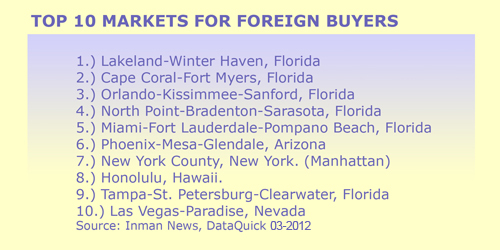 Last year we did an article which showed Cape Coral-Fort Myers market as the #2 US market for foreign buyers. I can report they are here and their presence is being felt in the market. Season is off to a bang and baseball hasn’t even started yet. Lookout roads! If you think the roads have been busy this year, it’s about to get busier in a week or so. A word of caution for sellers. It never fails that after a national publication or even a local one features foreign interest in our market, local sellers invariably ask us to sell their home to the foreign flavor of the year at higher prices. Sellers feel like if the SW Florida market is such a bargain to them they’ll gladly overpay for my property. The reality is the local SW Florida market may be a bargain, just not your property. Just because they’re interested in buying something here doesn’t mean they’re looking to overpay. If you had money to spare and were interested in buying in a foreign country, you’d probably do some research. Nobody wants to feel like they overpaid. If your property is overpriced to Americans, chances are Canadians, British, Germans, Brazilians, and all others will find it overpriced as well. When we report foreign buyers are finding value in SW Florida, it’s a good thing. It’s not an opportunity to get rich or get whole on somebody else’s ignorance because I assure you, when people buy they like to be educated. It doesn’t matter what state they’re from or what country. If you’re looking top sell, we could sure use the inventory, and opportunities are great right now. Give us a call. 239-489-4042 Make sure you speak with a professional who can help you navigate this market and price it correctly so you don’t miss out on a good market. Good luck, and Happy House Hunting or House Selling! Every day it seems I hear agents and buyers alike complain there just aren’t any listings on the market. If you’re an agent without listings or a buyer who can’t find anything that matches your criteria it certainly does feel that way, but sometimes feelings and reality don’t always match. Take the SW Florida real estate market for example. In the past few years inventory supply has been tight, and the few listings that were on the market either seemed to have multiple offers or was a short sale. Probably not entirely reality, but it did seem that way. With prices rising more and more sellers have realized they may finally be in a position to sell. We think there are more ready and willing sellers, if only they were able, just waiting to put their house on the market. At each incremental rise in price we’ll see more and more people deciding to sell. Many have been bottled up in their home, a financial prisoner so to speak for years. In a normal market SW Florida homeowners would trade up, down, or make lateral moves in real estate as needs changed. We haven’t seen that in the last several years. I think many homeowners have probably skipped one trade in their life cycle due to the real estate bust we all endured. Going forward we may see more slowly get back on that track as prices rise. If you’re an agent surfing the MLS you might not have noticed an influx of properties on the market. I just ran internal numbers yesterday and I saw a surge in inventory. We’ll be watching these numbers over the next few months. Could it be hundreds of homeowners decided to test the new market now that season is here? Why are buyers not seeing the listings? Last week at the CyberStars Summit we learned some agents nationwide are withholding their listings from sites like Trulia, Zillow, Homes.com, etc. for several weeks or altogether. These companies are aggregating Realtor data and selling leads back to Realtors using their own data. Agents are tired of seeing other sites rise in the search engines using their own listings as content to do so, so they’re changing the game a bit. We provide all the listings on www.Leecountyonline.com unless companies opt out of IDX. I don’t personally know of anyone doing that, but many are opting out of realtor.com, Trulia, Zillow, etc. Agents don’t so much mind other agents who are on the business promoting the selling of real estate. They do mind 3rd party companies using listings as content and selling leads back to Realtors, and that is the difference. So if you’re a buyer and not seeing all the listings online, you might want to check with your agent and see if they can set you up on their MLS portal or visit a site like ours. If you’re an agent and didn’t realize inventory has gone up, you might want to go back and check the MLS. You might be surprised to find a few more listings that match your buyer’s criteria. If you have a listing it’s always good to monitor the MLS to see if new competition has come onto the market that will affect your seller. We constantly look for new sales, new pendings, and new active listings to measure their impact on our sellers so we can properly advise them. It does no good to List it and Forget it. A listing is a process. It’s not sold until thousands of steps occur. Too many people think their job is done once they get a listing. The job has just begun. A full time active agent understands this, and this is why some properties sell and some sit on the market. Whether you’re a buyer or seller, it pays to price it right. Otherwise you’re just wasting a lot of time and money on something that will never sell. So get online and check out the market, or better yet, call an agent and find out today. Our number is 239-489-4042 if you need help. I kind of feel bad posting this given the blizzard that’s hitting the Northeast this weekend. While others will have to deal with so much fallout from the blizzard, I want to offer a solution to help those in need. Just take a look at our weather as provided by NBC-2 here in Fort Myers. 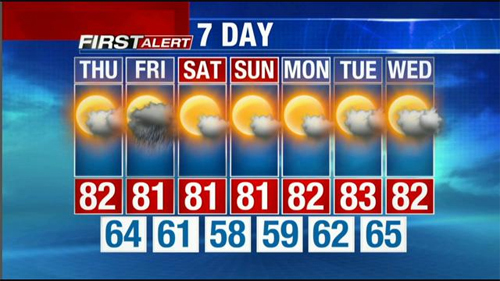 Chamber of Commerce Weather in SW Florida! I remember weekends like this back when I lived up North. I longed for the days I could one day call Florida my home. I didn’t know much about Florida only that it looked great on TV and that I was cold and miserable up North in the winters. One day back in high school I got the chance to travel to Fort Myers and visit my great grand-mother. From the minute I arrived I knew SW Florida was my home. I just needed to convince others that’s where we were going. I graduated from college on a Saturday and within 2 weeks I was in Florida. My mind was made up a few years prior, and that’s how it goes for so many that call SW Florida home. It seems everybody comes here from somewhere. When you visit here they call you a snowbird. When you move here you’re instantly one of us. I say that like I’ve lived here all my life when the truth is I used to be a snowbird too. And this is where the power of choice comes in. When you’re sitting at home snowed in, or in an airport stranded feeling badly about missing work remember one thing. Where you live is a choice. The pay scale is less in Florida and many can’t afford to move right now because of their jobs. Some don’t want to leave family. There are lots of reasons not to move. Moving isn’t right for everyone. Many of you are saying I will someday. Bear in mind we each have a set amount of time on this earth, and there is a cost associated with wasting days in places we don’t want to be. So I ask you, how long do you want to live somewhere you don’t want to be? For me the answer was not a day longer than I needed to. It was easy as I didn’t have roots yet of my own, and my family coincidentally had just taken jobs in Florida. Many decisions go into a move, and housing is just one of them. Work, schools, lifestyle, etc. all play into the decision. Maybe your time to enjoy paradise isn’t today. You can at least dream of paradise and ponder what if. What better time to search for properties in paradise than in the middle of a blizzard, assuming Internet and the power is still on. Google and NAR collaborated to uncover trends and insights around digital media usage among home shoppers, whether they were looking for an existing home, a newly constructed home, or an apartment. Together, Google and NAR’s individual research results offers insight into the process and how buyers are shopping for homes, selecting agents, and doing their research online. I’ve been poring over the report to glean some tips and the 27 page report is filled with useful information. I will share a few ideas agents should know about if they’d like to increase their sales pipeline. Interacting with buyers online is a process, not a one time event. The average buyer researches properties for 12 weeks before making a buying decision. 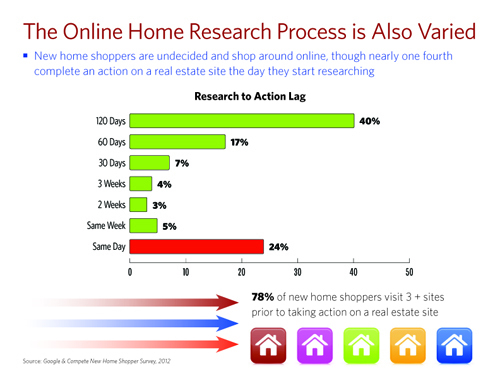 78% of home shoppers visit at least 3 sites before taking any action. 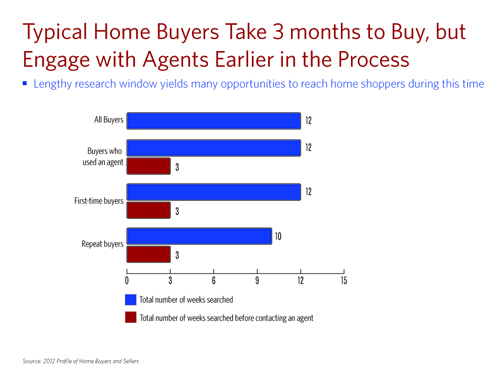 A typical buyer waits 3 weeks before interacting with an agent. If the average buyer shops online for 12 weeks they are selecting an agent early on in the process at 3 weeks. Most agents mistakenly give up on an online lead if they don’t make contact the first day or two. We feel that when buyers begin the process they like to do it anonymously as much as possible until they gain some market knowledge and comfort level with the process. Nobody likes to go into something blind and nobody likes to be sold to. The Internet is an empowering process because it provides information. Now, sometimes all that information becomes hard to assimilate and the information overload can bury a prospect to the point they give up and do nothing. This is where a trusted agent comes in. Once the buyer gains a certain amount of knowledge they typically look to select an agent who can help them sort out all the facts, areas, neighborhoods, zoning, local laws, etc. At that critical moment it becomes a moment of truth, and the buyer either acts or gives up. If an agent is patient with an online shopper and is there to offer help when the buyer is ready, that agent will gain the buyer’s business. If however the agent calls the buyer on Day 1 and hounds them each day for 3 weeks they’ll come across as a salesman looking for a sale rather than an advocate looking to answer questions and help the buyer. An agent really shouldn’t care when or what the buyer purchases. We tell people we’re here to help today, tomorrow, next month, or next year. If you build that trust and offer valuable insight, they’ll use you and it won’t matter when. The other thing agents can learn is it’s not about you. As an agent I might like a single family home in a gated community, but some buyers might like their space and prefer acreage. Still other buyers may like a condo, a waterfront property, or perhaps a golf course community. The possibilities are endless. That’s why I say it’s not about what the agent wants; it’s about the buyer’s needs. A great agent will listen to those wants and needs and offer advice to best suit that particular buyer. Believe it or not, some buyers actually want to live in the heart of everything while other buyers want to live away from it all. An agent can’t have pre-set ideas about what’s best for the buyer until they build that relationship and listen.